Learn About the Company History of Metglas®, Inc.
Metglas® Inc., located in Conway, SC, is a world leading producer of Amorphous Metal Ribbon. Since our company began in the 1970’s, Metglas, Inc. (then Allied Signal located in Morristown, NJ) pioneered the development and production of amorphous metal, a unique alloy that exhibits a structure in which the metal atoms occur in a random pattern. The key to Metglas Inc.’s proprietary manufacturing process is the rapid-solidification of molten alloy at a rate of approximately one million degrees Celsius per second. Metglas Amorphous Metals have a unique non-crystalline structure and possess excellent physical and magnetic properties that combine strength and hardness with flexibility and toughness. Metglas and Metglas products can help companies around the globe reduce their operating costs, strengthen energy conservation efforts and increase application efficiency. METGLAS®, Inc. is committed to satisfying all applicable requirements and will strive to exceed Customer Expectations using the creative input of our employees to continually improve our products and processes. To the best of our knowledge, our raw material suppliers also do not intentionally add these elements to the products we purchase. A sampling of our finished foil by an A2LA / NADCAP certified laboratory shows that all metallic elements listed above were found to be less than ten parts per million ( < 10 ppm ). This statement is based on knowledge as of the date of issue. 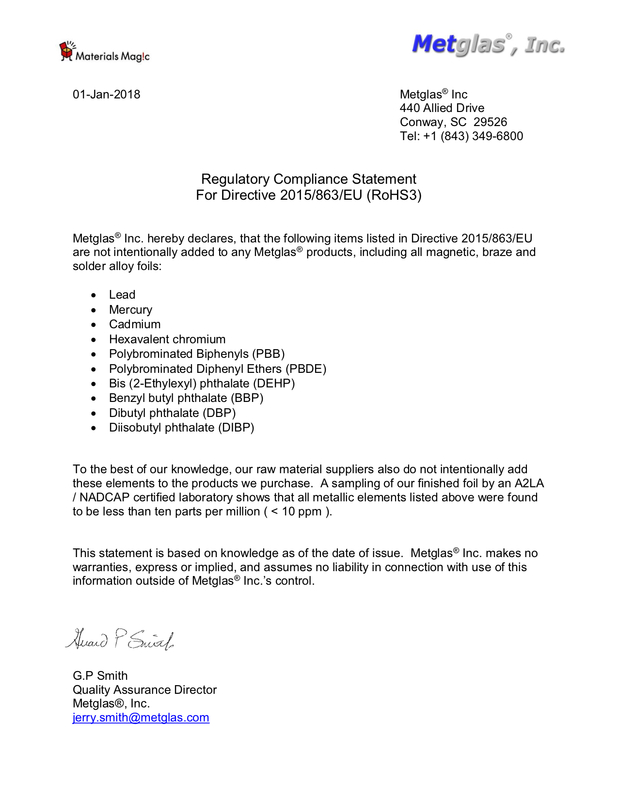 Metglas® Inc. makes no warranties, express or implied, and assumes no liability in connection with use of this information outside of Metglas® Inc.’s control.